- Yangon wave always. You can discover their culture & history from their daily-life. - Vientiane 6. Travel insurance option. 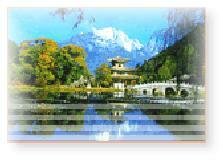 - Colombo Hong Kong to Kunming on Dragonair flight by your own travelling. * Vietnam You will be met and transferred to your hotel. Mid-East and Xishou Village. (included breakfast, lunch & dinner). Package Conditions Morning transfer to Lijiang by car, where the Naxi minority are based. Package Price List Visit Black Dragon Pool and the Old City. (included breakfast, lunch & dinner). Bus Ticket and Hua Ting Temple. After that, fly back Hong Kong with Dragonair. Train Ticket (included breakfast & lunch).